Sassui Palijo after Sindh’s archaeological sites? The people orchestrating the fiasco was the ex-MPA Ghulam Qadir Palijo who also happens to be the father of the Sassui Palijo a Sindh Minister for Culture and Tourism. Ironically a news report appeared in The Nation yesterday where Sassui Palijo while speaking in the Sindh Assembly urged the President of Pakistan Mr. Asif Ali Zardari to fulfill his promise and hand-over the control of archaeological sites to their respective provinces. She went on to claim that the paperwork was being done to give control of the historical sites to provinces very soon. Makli Necropolis is one of the largest necropolises in the world, with a diameter of approximately 8 kilometers, Makli Hill is supposed to be the burial place of some 125,000 Sufi saints. It is located on the outskirts of Thatta. Legends abound about its inception, but it is generally believed that the cemetery grew around the shrine of the fourteenth-century Sufi, Hamad Jamali. 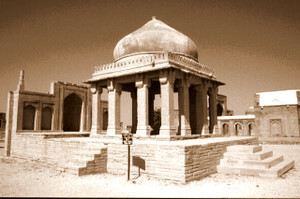 The tombs and gravestones spread over the cemetery are material documents marking the social and political history of Sind.